Over at Timber Hill Threads two quilters are having fun making "Nellie Birds". I love these birdies, and the way you can put them anywhere you want them is great. Real birdies just fly away! Happy holiday to all. 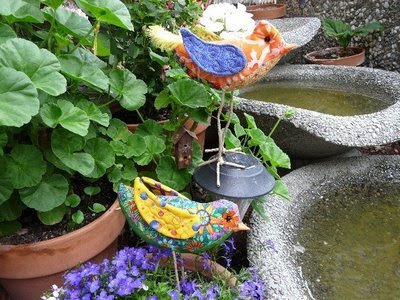 The Nellie birds are so lovely and really enhance the garden setting. Happy July 4th to all our American bloggy friends out there. These are really great photos to show off the birds. Hi Nellie, seeing the birds outside made me think about Papervol...its something I've seen at dharmatrading.com that is applied to fiber to make it waterproof and ables the item to be kept outside. Have you tried something like that?